Creating the right look for a character on the stage is one of the tasks of a costuming department in a theatre. When creating a hat for a character, a felt hat must have the material draped over a form, or hat block. The hat block must be able to accept pins to hold the material in place, as well as stand up to the heat of the steam to mold the material. The hats themselves may curve under the block, so a complex hat block has to be disassembled in order to remove the finished hat. The Drama Department at University of North Carolina at Chapel Hill has a few hat blocks that came from the 40’s, 50’s, and 60’s, but they are worn from use and, perhaps, not the right size for current actors. Furthermore, the making of a hat block using “traditional” woodworking techniques is becoming a lost art. But one student at UNC Chapel Hill is working to revitalize the art using digital technology. 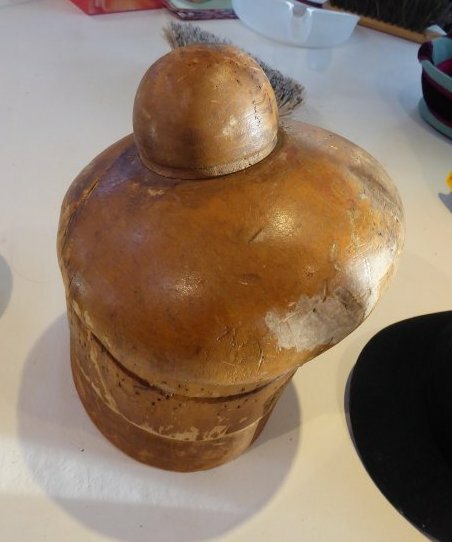 Anatomy of a Hat Block. This block has a separate top knot that fits into the base pieces. The bottom part has been sliced in two, with an internal “key” that holds the pieces together while blocking the hat. The parts can be separated to remove the block without distorting the finished hat. Note the wear and holes from use. 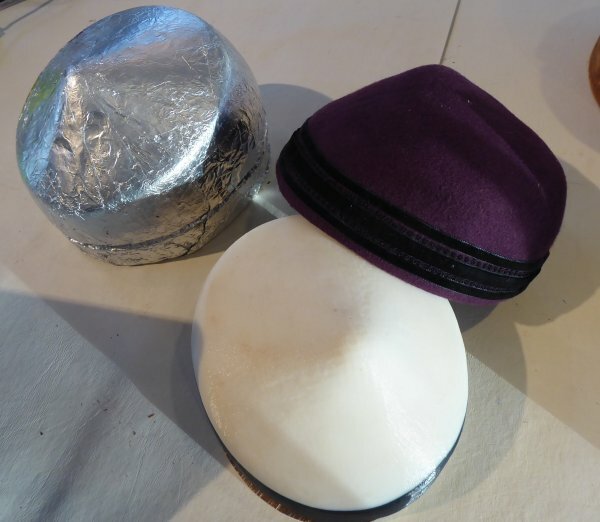 During a graduate class in millinery at the UNC Chapel Hill Drama Department, Athene Wright became interested in using digital fabrication techniques to recreate hat blocks. 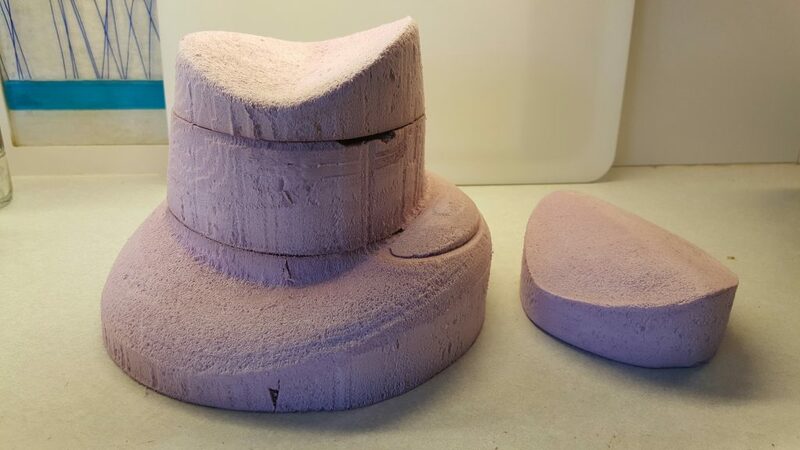 Under the direction of Rachel Pollock, Craft Artisan and Lecturer, Athene took on the task of creating a digital file of a crown block with a conical tip. 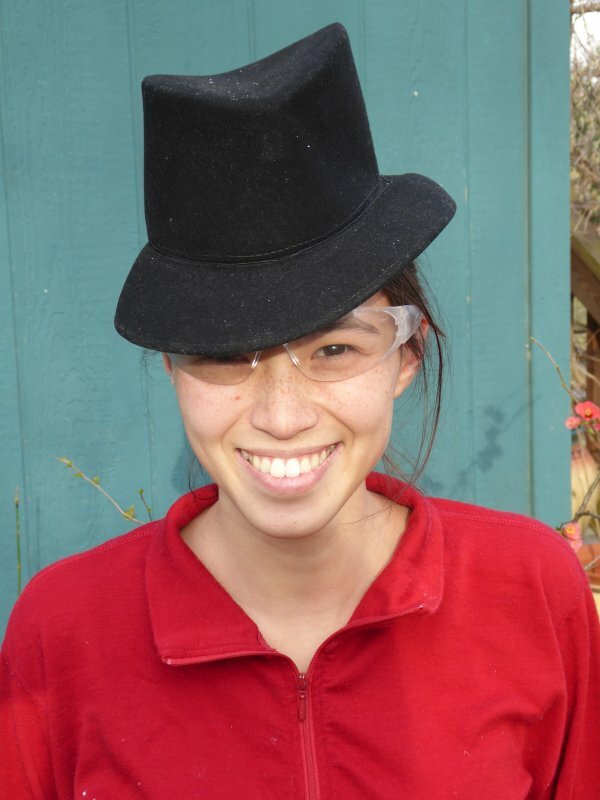 She worked with Brad Erickson at the UNC Makerspace to create a 3D model of the hat by taking multiple pictures from different angles, and stitching them together in a software to create a 3D rendering of the block. 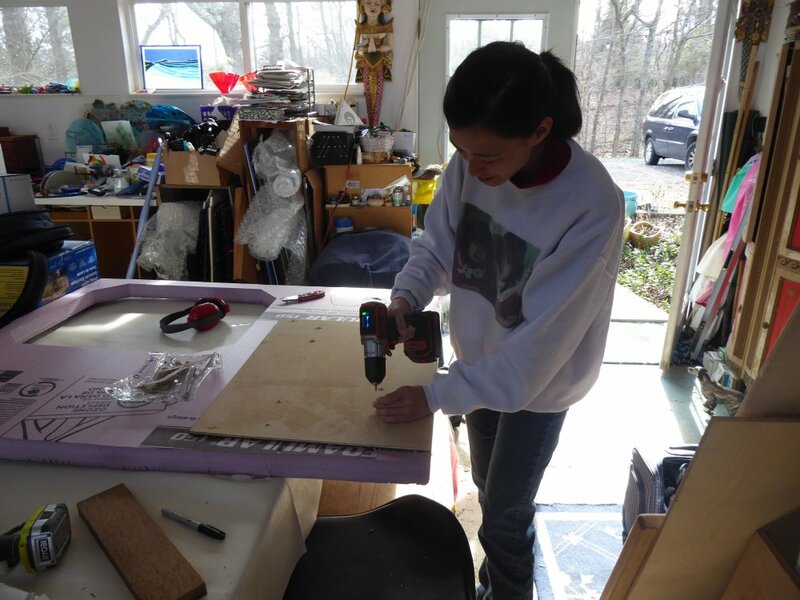 She then 3D printed the file, adding a wooden base because the ABS plastic of the 3D print would not hold up when pins were pushed into it. More information and the files can be found at Athene’s website and Thingiverse post and on Rachel Pollock’s blog, La Bricoleuse. 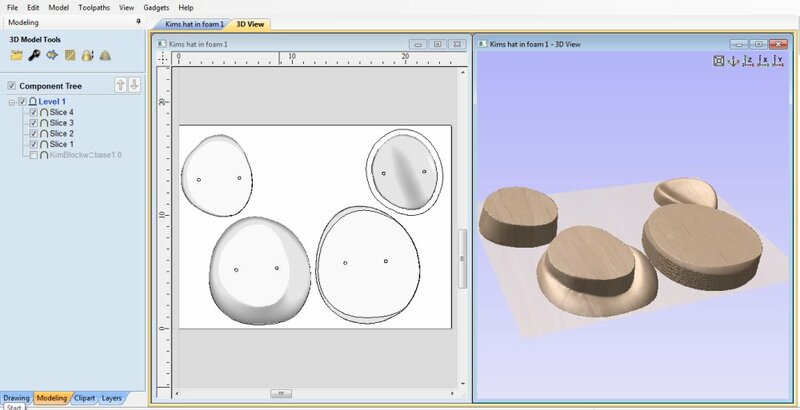 Athene’s first iteration of recreating a hat block using digital technologies. The original hat block, covered in foil, was photographed from multiple angles, and the photographs stitched together to create a 3D file. The .stl file was then printed on a 3D printer, and the ABS part attached to a wooden base. Athene’s finished wool hat is also featured. Seeing this hat block was like seeing an old friend. In 2012, Rachel brought it to the studio, and we tried an early version of 123DCatch to make a 3D model. The final model was never realized, but I was excited to find the record of the attempt on my computer. 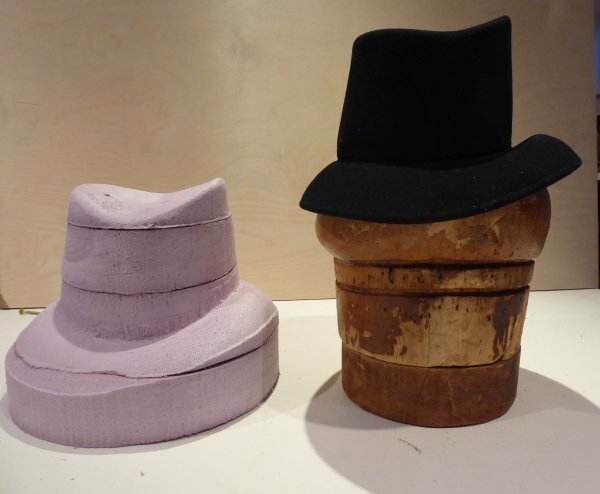 In her blog, Rachel mentioned that another student, Candy McClernan (MFA ’13) used a more traditional technique to reproduce the same hat block by draping the original with plaster bandages, then filling that with a two-part rigid foam. While this technique does recreate the original, it is more difficult to modify the size to fit the head of a different actor. Once there is a digital file, however, the size and shape can be modified on screen to fit different actors and a prototype generated before the final shape is committed to a more durable material. Athene’s quest to create digital files had another purpose. It’s one thing to recreate a hat block itself, and another to create a new block from an existing hat. You can’t make a physical cast of the hat without ruining it, and you can’t recreate the hat without the block. Athene fell in love with a hat from the 40’s that perches at a jaunty angle on top of the head—so, she again drew on the services of Brad Erickson at the UNC Makerspace to create a 3D model of the hat. Using a 3D scanner, they created an .stl of the hat, and Athene brought it to the studio for machining a prototype in foam. Athene modeling the hat, lent by Kim Fraser for the duration of the project. 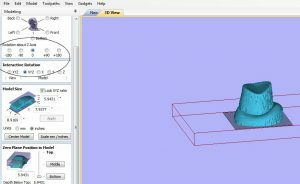 The first step was to bring the .stl into VCarve Pro for toolpathing. The techniques was similar to that described in the blog Machining 3D Scans with a ShopBot CNC. The added twist was using the Interactive Rotation to get the model aligned in such a way that the details that gives the hat its jaunty feel could be machined from the top down with no undercuts. Once the file was imported, it was sliced to fit the 2” pink insulation foam that we were using to prototype. In the image above, note that the original component (the last in the list) is turned off, and the 4 layers and their vectors have now been spread out on the material. For hold down, we indicated where it was safe to put a screw, and, from the bottom, placed screws through a thin board and into the foam. 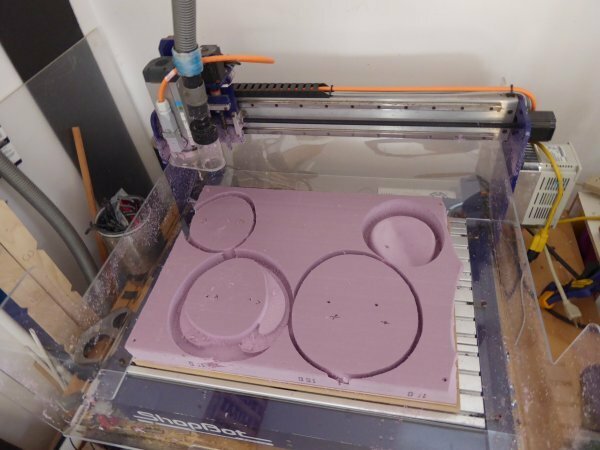 Then, the foam was cut to size for the ShopBot Desktop (24” x 18”). The thin board/foam was flipped and screwed to the Desktop sacrificial board. The roughing passes have been completed on the three slices on the left, while the finish pass has been completed on the slice in the upper right corner. The bit was a .25” ball nose bit. 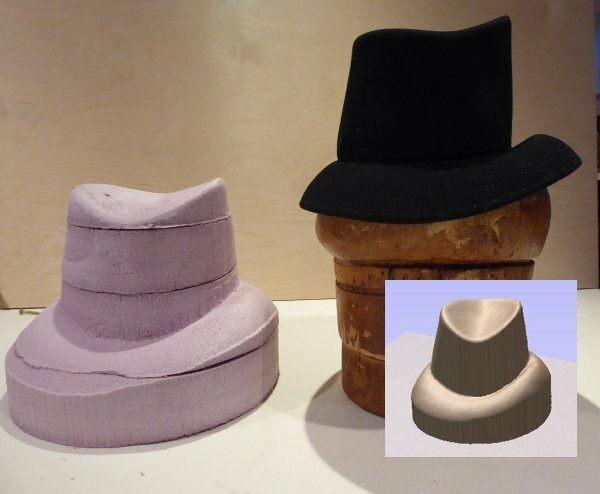 The original hat (sitting on another hat block) and the first iteration of the hat block. Because the .stl did not save as the same size as the original, we had to guess at the desired size when we imported it. Oops, the first prototype was larger than we wanted. The prototype resized to be slightly smaller than the original hat to compensate for the thickness of the material draped over the hat block. With the resizing in all three axes, the number of slices was reduced from 4 to three. At the right is the “tolliker” which is placed on top of the hat to weight the material in place. Once this prototyped is approved, the final hat block will be machined out of a suitable wood.